Chad Eschler – J.H. Findorff, Inc.
Every month we feature an industry expert who answers some questions about topics related to commercial real estate. This month, Chad Eschler, Business Development, JH Findorff & Son Inc., provides great insights into the construction process. Hopefully after reading this article you will be as excited about the construction process as you were when you were looking for your new space! I have been blessed to work for J.H. Findorff and Son for the past 11 years. Findorff is a General Contractor with 127 years of construction experience based in Madison, Wisconsin. Our company completes work in Iowa, Minnesota, Wisconsin and Illinois. During my 11 years at Findorff, I have had a variety of roles, but the most pertinent role to this topic is when I managed our Special Projects Group. This group of construction professionals focused on projects under $500,000 and completed over 300 projects per year. In the following paragraphs, I will highlight some of the lessons learned to help you through your next construction project. I’ll start by saying congratulations! Your business is growing or you need to relocate to update your business. You have looked at a variety of spaces and found one that will be a great fit, but it needs a little work (or maybe a lot). What’s next? Who do I call? How long will it take? How much will it cost? If these questions sound familiar, I’m here to help. Design/Build – this is where the contractor and architect design and construct the project as a team. That team could be under one company or an architect and contractor would work together to form a team. 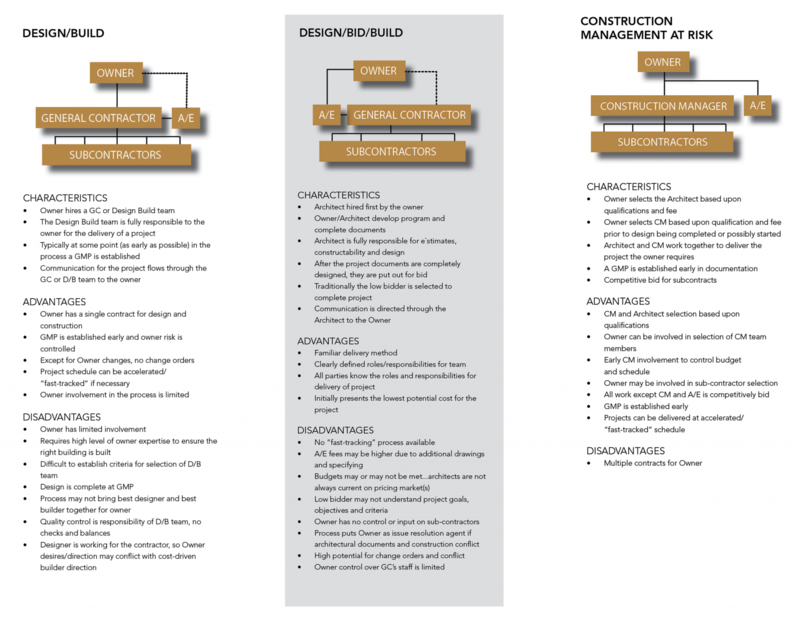 Design/Bid/Build – this method applies to most municipal work. The architect is selected, then bids are solicited from contractors. Low bid is awarded the project. Construction Management at Risk – we have seen more projects with this approach over the past year. Owner selects both architect and contractor based on qualifications and fee. Architect and contractor then work together to deliver the project within the owner’s budget with an open book approach. See the charts below for advantages and disadvantages of each (click here to see full-size image). Once you have decided which approach you would like to take, you need to select a contractor. Your broker may have some suggestions or the owner of the property may have a contractor they use. Personally, the best approach is to meet a few contractors to find one that you feel comfortable with. Talk to them about experience in projects of your size, how long have they been in business, do they have the staff to complete the project in your timeframe and last, but not least, ask for references. Time is the next item you need to look at. If you are only doing a refresh (paint, flooring, etc. ), time is on your side. Typically for an interior refresh you will not need a building permit for your project. It’s when you get into moving walls, changing entrances or updating the bathrooms that you need to start looking at time right away. For a larger project, you will need a building permit. To get a permit, you will need an architect. The permitting process can take anywhere from 4 weeks to 16 weeks depending on the complexity of the project. On top of the permit process, you will also need to know how long the construction process will take. This is why it is so important to engage a contractor early. We recently had a customer request to add a few offices for new employees. Simple project, right? The customer thought that we could start the following week and have the project completed in two weeks. We could get the work done, but as of today it takes anywhere from 6 – 12 weeks to get a commercial door to match existing doors. Everyone’s favorite topic. Depending on the project approach taken, the level of details about cost can vary. From an “open book” concept to a hard bid situation, costs should be an upfront discussion. From the contractor’s side, the more information we know about your budget, the better. I typically get the answer about budget “I want my price as low as possible”, but without understanding what “low” means, we can’t deliver a successful project. The budget or bids that you are given should be covered in detail prior to starting construction work. Sit down with your contractor to cover line by line the costs for your project. Have the contractor look for alternatives that can save money either upfront or long term. An example of this might be conventional lighting vs. LED. It may cost a little more up front, but in the long term your energy usage might be much less. When I entered the construction industry it was very apparent to me that schedule and costs were very important, but most of all, communication was key to completing a successful construction project. Your contractor should have a communication plan in place as to how to handle communication with you during weekly project meetings and your new neighbors about the upcoming construction project. There are a variety of tools we use to communicate. From our Executive Summaries to our pre-install meetings, our goal is to keep you informed as much as possible throughout the construction of your new space. Make sure your contractor has these tools to keep you informed on the project’s progress. 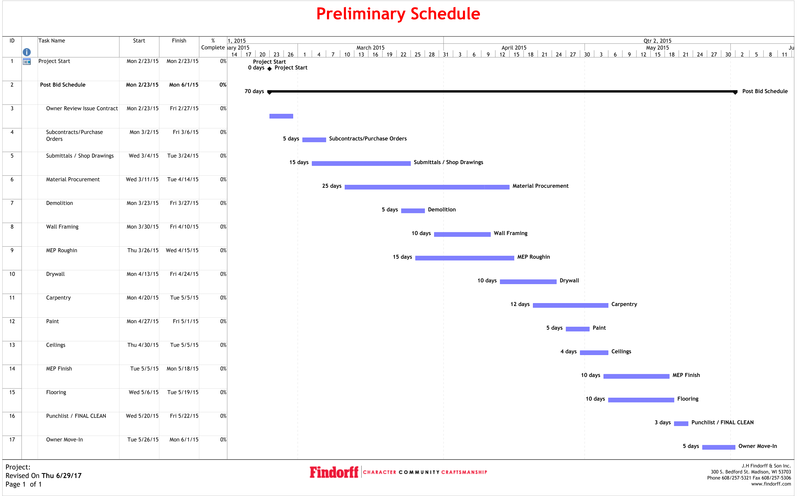 When you and your contractor are able to master the Schedule, Costs and Communication for your project, you will be set up for a successful project. Our goal is to make sure that the project is enjoyable so you will want to build again!